Wall mount for LCD display (Tilt & Swivel), black, screen size: 10"-30"
The NewStar LCD/TFT wall mount, model FPMA-W75, allows you to mount a flatscreen to the wall. The mount has 3 movements offering maximum flexibility. This model allows users to swing, tilt and turn the flatscreen for maximum efficiency and comfort. Depth: 8 cm. It easily connects to the back of each flatscreen due to the VESA hole pattern. 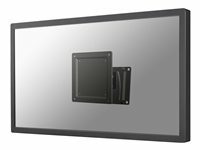 This wall mount holds screens up to 10 kg with a VESA 75x75 or 100x100 mm hole pattern. Ideal to mount screens up to 24" to the wall.